Devops Done Right: Stay Away Replication Lag ! Stay Away Replication Lag ! Recently, I got a requirement to facilitate backup for the data and a way to analyze it without using the main database. 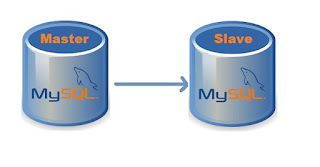 MySQL replication is a process that allows you to easily maintain multiple copies of MySQL data by having them copied automatically from a master to a slave database. Everything was running smoothly in the night I configured it. But the joy didn't last for long as the traffic hits in the morning, slave starts getting behind the master with few seconds which increases with the activity on the application. At the peak time, it was playing in thousands of second. First of all, master writes replication events to a special log called binary log. This is usually a very lightweight activity because writes are buffered and they are sequential. The binary log file stores data that replication slave will be reading later. This process connects to a master, reads binary log events from the master as they come in and just copies them over to a local log file called relay log. Even though there’s only one thread reading the binary log from the master and one writing relay log on the slave, very rarely copying of replication events is a slower element of the replication. There could be a network delay, causing a steady delay of a few hundred milliseconds. Read_Master_Log_Pos – binary log from the master is copied over to the relay log on the slave up until this position. And then you can compare it to the output of “show master status/G” from the master. The second process – SQL thread – reads events from a relay log stored locally on the replication slave (the file that was written by IO thread) and then applies them as fast as possible. Exec_Master_Log_Pos – which position from the master binary log is being executed by SQL thread. Replication lag occurs when the slaves cannot keep up with the updates occurring on the master. Unapplied changes accumulate in the slave's relay logs and the version of the database on the slaves becomes increasingly different from that of the master. Let me take you through my journey how I crossed the river. But unfortunately, or say, it was my benightedness towards Database Administration that I was still searching for that twig which can help me from drowning. STATEMENT: With statement-based replication, every SQL statement that could modify data is logged on the master. Then those SQL statements are replayed on the slaves against the same dataset and in the same context. There is always less data that is to be transferred between the master and the slave. But, the data inconsistency issue between the master and the slave that creeps up due to the way this kind of replication works. ROW: With row-based replication, every “row modification” is logged on the master and is then applied to the slave. With row-based replication, each and every change can be replicated and hence this is the safest form of replication. On a system that frequently UPDATE a large number of rows, it produces very large update logs and generates a lot of network traffic between the master and the slave. MIXED: A third option is also available: mixed logging. With mixed logging, statement-based logging is used by default, but the logging mode switches automatically to row-based in certain cases. The Binary Log Format is updated on Master MySQL server and requires MySQL service restart to reflect. It can be done for Global, Runtime or Session. So, earlier I was using STATEMENT BinLog Format, which is default one. Since I switched to MIXED BinLog Format, I am very delighted to share the below stats. Current status of Master Read and Slave Execute position difference and Slave Lag (in sec), both are ZERO. Replication Lag (in Seconds) graph for a month, powered by Prometheus-Grafana.